Over the past year, there has been a lot of debate about whether Facebook is dying out. Is it losing its fan base to other rising apps and networks, such as Instagram and Google+? Or is it becoming unpopular with teens because it’s just not the “cool” thing to use anymore? While bloggers and analysts are treating the issues as some new scandal, we have seen this topic arise before when Twitter came on the scene in 2006. Everyone thought Facebook would lose out to Twitter, because Twitter was the new trend and more versatile than Facebook. However, Facebook responded by making itself more adaptable to the changing trends and incorporating Twitter into its very structure, thereby ensuring its survival. Now Facebook and Twitter coexist, and it is clear neither one is about to eliminate the other. Facebook is really not in any danger of becoming obsolete. It is still considered a great networking tool that lets you connect with people that you may not get to see every day. Facebook has been around since 2004 and has only steadily increased users every year since its appearance on the market. 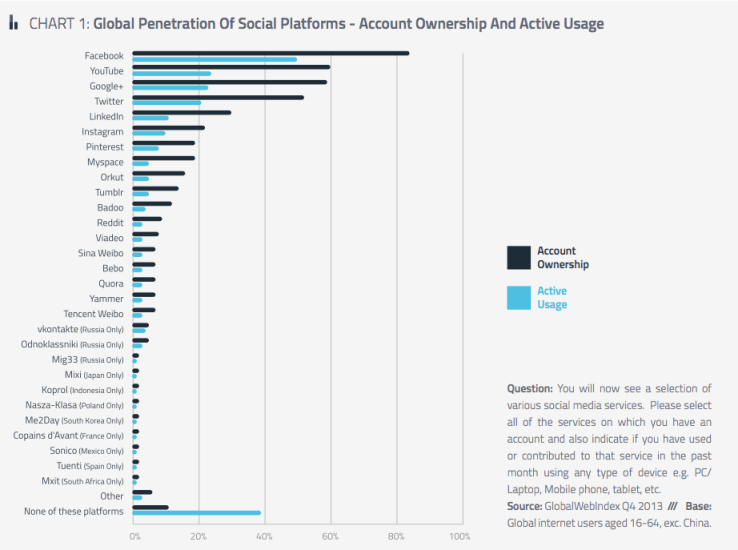 Facebook is currently the #1 (most popular) social network worldwide, surpassing YouTube, Google+, Twitter, and Instagram by at least 20% account ownership and active usage (see graph below). In most consumers’ opinion, Instagram is the current biggest threat to Facebook. However, what most users might not realize is that Facebook now owns Instagram, therefore making the threat obsolete. Basically, analysts and other opinionated bloggers can try to predict what they want about Facebook, but the facts seem to speak for themselves. Facebook has been around this long and is not going anywhere anytime soon. The purpose of this blog is to provide an easy-to-understand and easy-to-use method of predicting conversions off of a chosen variable in an Adwords account. Keep in mind – this is the simplest way, and therefore one of the less accurate. You’ll get a good estimate, but some more heavy lifting is needed to factor in the huge number of variables the average account has. Now, from this spreadsheet go to the headers – they’ll be the top row, and select the arrow next to the filter that says “Clicks”. 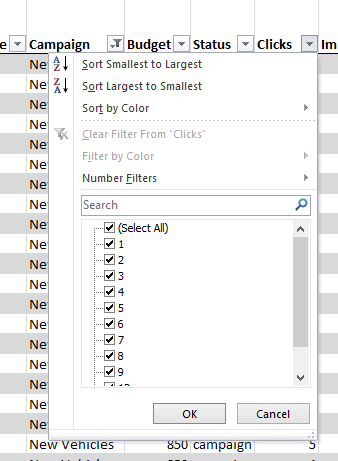 Once you reach this menu, click “Sort Smallest to Largest” at the top. 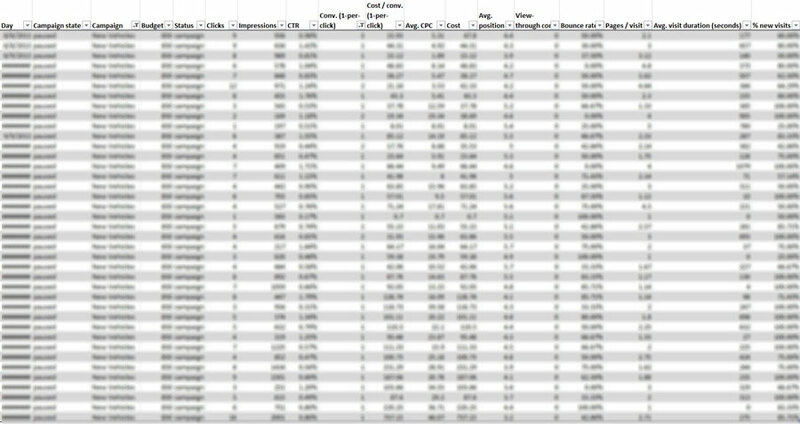 This will sort all of the data according to number of clicks. 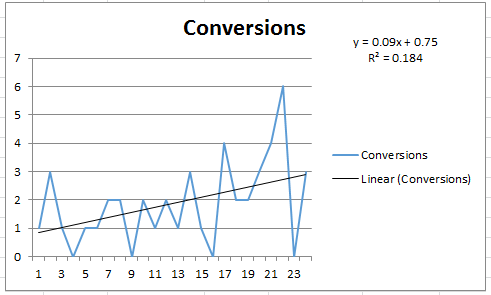 Once you have your variable and conversions data sorted properly, go ahead and make a line chart out of the conversion data. 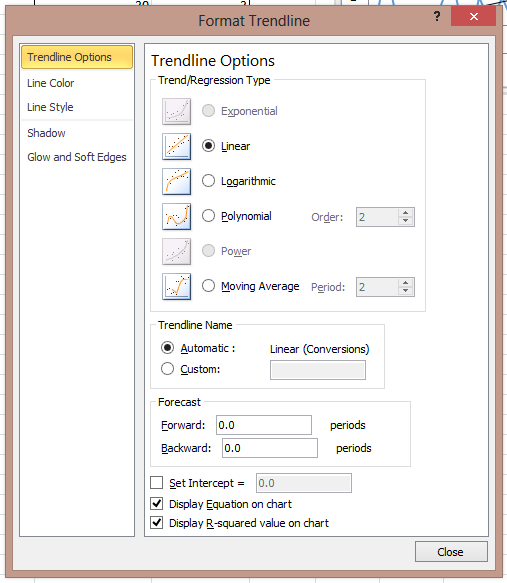 Just highlight the conversions data column, and click to insert Line Graph on the top right. 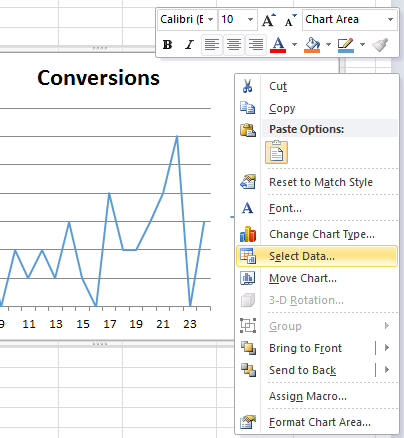 Now you have a graph of conversions sorted by the number of clicks. There are still a few more formatting things to be taken care of before we get to the predictive model. Congratulations! Your graph is ready. The Y= equation in the top right is your new predictive model. Simply plug how many conversions you want into the Y position, and solve for X. This will get you however many of X you need (within a range, of course) and help you plan your budgets alongside your goals. The R2 value below the equation is a measure of the accuracy of the equation, see the Wiki. The higher this is the better. You see a lower R2 here because we’re only taking one variable into account. 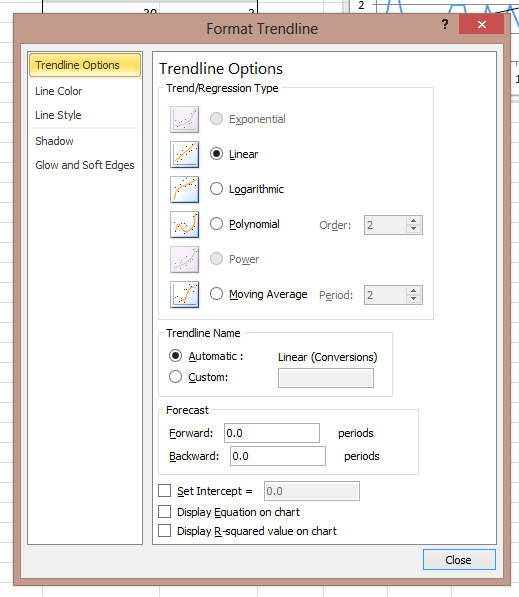 Next, I’ll show you how to make it a simple tool in your spreadsheet so that you don’t have to solve the equation by hand every time you want to predict something. 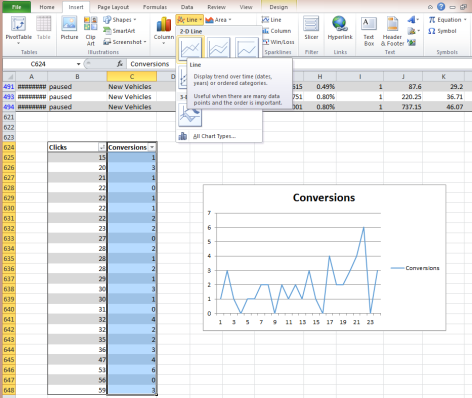 Once you have that, you can make a table in excel where you can easily change your desired conversions and get an estimate on your variable. Make a 2×2 table, one column is Conversions, the other is your variable (for me it’s Clicks). In the variable column, put in your modified equation, with Y being the cell under conversions. 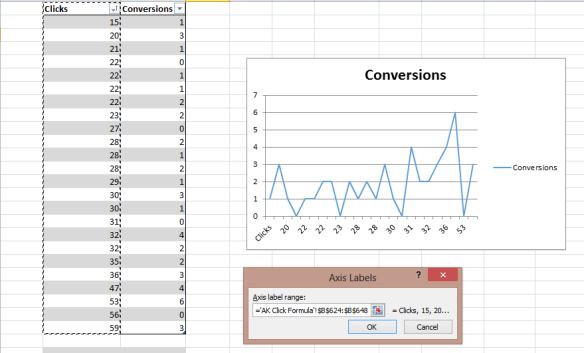 For the spreadsheet I’m using in this example, the cell under “Required Clicks” is “=(F645-0.75)/0.09”. Evolution exists in all things, whether it’s reactive to environmental changes, a species’ need for survival, or the product of a situation that is strenuous. Evolution is also very visible within design globally, resulting from all three vanes of the aforementioned. The smart phone was a perfect example of a product that caused a demand that forced designers to evolve into another form or else they were seemingly not as relevant, nor would they be thriving. From Static design, to Interactive design, we as designers have had to grow in several ways, shedding the invaluable techniques of yesterday to grasp the new forms that growing demand has created. A recent acquisition by Google has sparked the recent thought that we as designers, as well as citizens, may be about to witness the next echelon. In an article posted on Wired, they detail the pertinent as well as ephemeral effects of Google’s whopping $3.2 billion acquisition of Nest. In short, an inkling of the possibility of Google moving into more ambient hardware. Nest has a product titled “Nest Protect”, a simple smoke detector with a twist. Rather than a mundane household item that is more annoying than utilitarian, the alarm demonstrates more interactive capabilities that build an active memory and allow the hardware to react to the user, rather than the opposite. This design is ambient, responsive and extremely innovative. While not the most mind-altering invention of our time – it will bring about a new era of hardware. Once Google fully gains a grasp upon the creative capacity that this form of software melded into hardware can accomplish, I feel as if the dawn of a new design will be upon us. 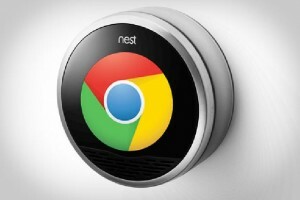 Ambient Design will be at the core of nearly all integral hardware coming from Google. The hardware will begin with the responsive ideology from Nest’s household products, but now powered by the informational, intrapersonal titan that is Google. Google search engine already responds to your prior requests and queries based on past information. Hardware that is integrated with this evolving database of personal information could have us living in a network that slowly times itself to our tendencies. Answering questions before we ask, updating us before we show concern, creating an assistance system that will become second nature. Technology that is ambient will become integrated into our daily activities, rather than us taking time out to interact with the technology. Rather than us responding to our technology, technology will respond, live and learn beside us instead. This core difference should allow us to live our lives without pausing constantly for our gadgetry, providing a more productive flow of activity. On the other hand, Google will have more influence on our life, as well as access to information on our daily living, which could make many consumers wary. Google will have to design a product and marketing campaign that is friendly, unassuming and unobtrusive in order to ease people into giving up their comforting level of privacy. Not only will the design have to be consistent, clean and minimal, it will also have to systemically provide a big enough improvement to the life of the average person for the reward to lighten the load of the daunting risks. This begs the question: how does one design such a thing when there is no original source for reference? We will all soon see, because after Google announces their new wave of creation, along with its Google Glasses, Apple must produce a rebuttal which will lead to the next era of hardware for consumers. Not only will these changes alter daily life for everyone who can afford it, but the design world will forever change. We will have to attack problems from the view of the products’ response rather than the human’s response. We will have to create products that are humanly conscious while docile enough to not generate fear. A product or design that knows when to talk and when to listen. A product that observes without staring, that listens without hearing, a design that is so foreign to designers. We are used to responsive design that responds to the action of a human interaction with the product. Never has it been to the point where the product has to learn, as well as evolve new methods of interaction with its user. These are all thoughts, nothing set in stone, but I hope these thoughts can be the stepping stones to question. To question what comes next in the path of evolution for the design world. I would love to hear anybody else’s thoughts on what they think Google’s acquisition means for the consumer as well as the design world. I believe the next step we take will be in unison and an exciting venture into the future. Some people around the office have asked me about how I make illustrations. I figured I’d break down my technique and show you all how you can go from a simple idea on a napkin, to a full-colored piece! One of my latest works will serve as an example. Everyone, meet Fuzzy Ferndale the dog! Yeah, I don’t pick the best names. But he was first conceived as a fuzzy Dr. Seuss-esque character on a napkin at a Denny’s. If I still had the napkin, you’d see it here. 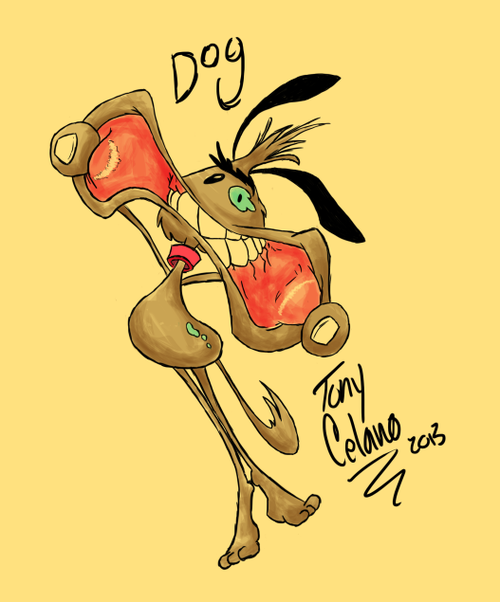 But I opened up photoshop and went to work with my drawing tablet. I sketched out several head shapes. Smiles, weird smiles, and even weirder beaks galore. 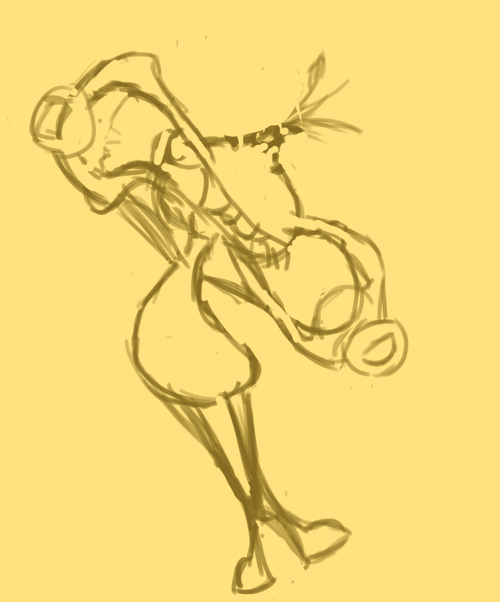 I usually fill the digital canvas with a color to keep me in the mood to draw out the entire character. That’s why the background is a warm yellow. 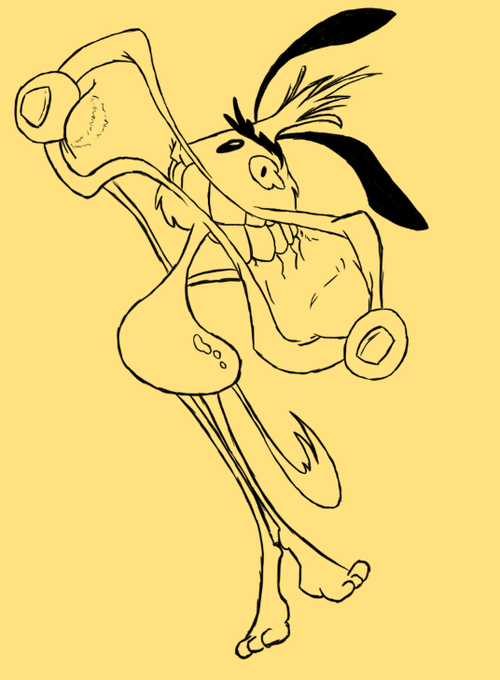 Even with all the awesome tryout sketches, I ultimately decided to go with something entirely different—a dog making a funny face. I started to sketch that out. 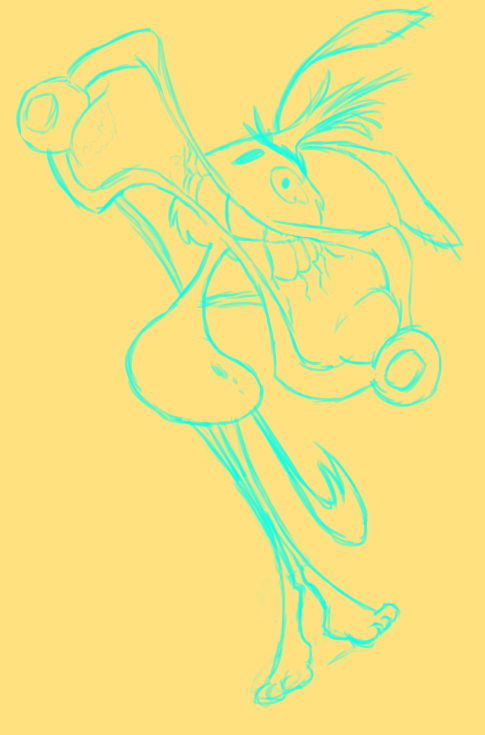 Then I went in with a blue color for a more thorough sketch. 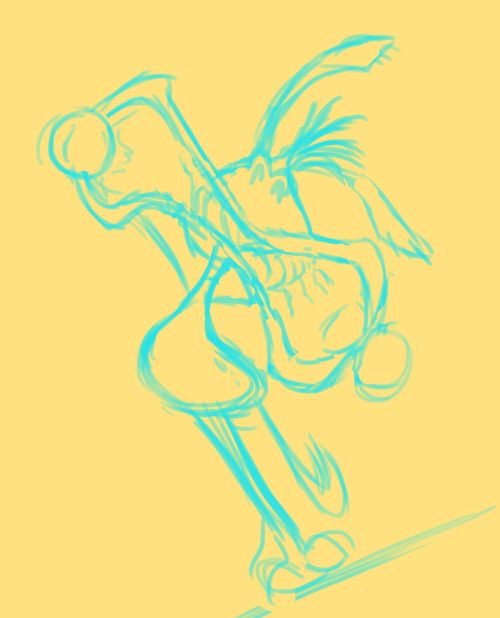 Traditionally, blue is used for sketches because when photocopied, the blue wouldn’t show up. The final dark lines would be inked on top of the blue lines and when scanned, yields a beautiful result. Even though this is photoshop, I still use the blue method. I go in once more with more detail. Then I add the final lines. It looks great if I do say so myself! Now let’s add color for fun. I’d like to do a watercolor pattern. And voila! It’s complete! Here’s a little video compilation of the process. I hope you learned a bit, and use this method to make some awesome illustrations of your own! Try it out, and post it as a comment under this blog! I actually just began using Waze at the end of 2013 but it has been exceedingly useful in some scenarios. It offers free GPS navigation that automatically updates the best route for you to take depending on traffic patterns. It’s user-based, so you can actually see other people on the road that are using the app. Passengers will report cops sighted, vehicles on the shoulder, and other useful information that the app will then tell you to “watch out” for as you drive. All I know is, it took me 5 and a half hours to get to Virginia Beach from Baltimore when I wasn’t using the app, and only 3 hours and 45 minutes to return home when I did use it. If you are ever travelling abroad, this is a must-have app. You can call and text anyone else that has Viber entirely for free, without having to worry about whatever international plan your service provider might offer. I used this many times over the year with my best friend who was in Thailand, and then I used it to contact people in the U.S. when I went to Thailand in April 2013 to visit her. You just need wifi to use it, so if you’re in a very remote area that doesn’t have wifi then it’s not going to be as useful. I helped to plan a wedding in May 2013 and did a lot of research on the best wedding apps. I decided that WedPics was definitely the way to go, where people attending a wedding can share all their camera phone pictures in one location. Then, the bride and groom can see and download all the photos at a later date. Some similar apps, like WeddingParty, had a more attractive design but didn’t function as well. Do you love crafting and roaming the aisles of Michaels? Then I hope you have this app. They constantly post coupons for 40 – 50% off one regular price item, and you can easily have them scan the mobile coupon at checkout. I have used this countless times over the past year. Is there a new movie coming out on Redbox that you’ve been anticipating for months? If you have the Redbox app, you can actually see which Redbox locations have the movie in stock, and even reserve it for yourself! Much more efficient than driving around to all the Redbox locations in town, hoping to find a newly released movie. Not so new, but always useful. This is probably one of the most practical apps I have on my phone. I have moved 7 times in the last year and half, and always whip out my iHandy Level to hang anything in a new apartment. Remember how I said I’ve moved 7 times in the past year and a half? Well another app that helped me was the rental finder PadMapper. You can enter filters for what you’re looking for in a rental (price range, number of bedrooms, etc.). Then, PadMapper pulls from multiple websites that have rental listings online (including Craigslist) and shows you pinpoints on a map of ones that fit your requirements in the area you’re interested in. As a visual person, it really helped me to see all the available listings on a map that I could then click on and be taken to the original listing for more information. Overall, if you’re not a 23 year old crafty girl that likes to travel and moves a lot, then this list might not wildly impress you. But, these are the apps that I held very near and dear to my heart in 2013 and hopefully one – or all – are something that you’d like to try, too!